Resource of trial experience. Trusted neutral. 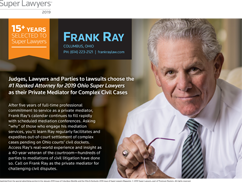 In 2017 and again in 2019, Super Lawyers ranked Frank A. Ray as the #1 lawyer in Ohio. For more than four decades, Mr. Ray performed as an accomplished civil trial lawyer who concentrated on helping individuals and businesses recover their losses. In 2014, Frank transitioned from the trial practice to full-time service as a mediator of civil disputes. During his former career as a litigator, Mr. Ray applied his trial experience to help his clients achieve justice. He served as lead counsel in state and federal courts in 129 civil trials and in more than 70 state and federal civil appeals. Drawing on his experience from a broad spectrum of civil litigation, Frank offers guidance as a mediator to help people, businesses, government, and insurers achieve justice by avoiding the risks and uncertainties of a trial. As a solo practitioner, Frank Ray offers directly accessible personal service. People, businesses, insurers, and government and their lawyers seeking mediation services deal directly with their mediator, Frank Ray. To prepare for mediation sessions, Frank seeks to understand all relevant facts and issues to your case. Mr. Ray wants to study and comprehend what happened to cause the dispute. Drawing on his extensive experience in the trial of cases before juries and judges as a resource, as a neutral Frank will guide adversaries to resolution through mediation. Once you have engaged Frank as your mediator, he commits to regular contact with counsel to prepare for the mediation conference. Frank thoroughly examines submitted materials on the case in order to understand issues and apply that understanding to the mediation process. Just as he prepared for his trials, Frank Ray applies the same work ethic to preparation for his mediations. When you need a respected professional to serve as a private mediator for a complex civil dispute, reach out to Frank Ray of Frank A. Ray Co., L.P.A. at 614-223-2121 or contact us online. When Frank Ray actively practiced as a trial lawyer, fellow lawyers regularly turned to him to produce results for litigants. Now, lawyers, judges, corporations, and insurers look to Frank to achieve resolution through his service as a mediator of civil cases. Honda of America Manufacturing, Inc.
Frank A. Ray Co., L.P.A. is located in Columbus, OH and serves clients in and around Brice, Groveport, Reynoldsburg, Canal Winchester, Blacklick, Hilliard, Summit Station, Columbus, Lockbourne, Carroll, Etna, Lithopolis, Commercial Point, Pickerington, Baltimore, New Albany, Westerville, Kirkersville, Pataskala, Amanda, Ashville, Delaware County, Fairfield County, Franklin County and Pickaway County.